Actually, it has been more like six decades if you count the discourse leading up to creating it in the mid-1950s. It took a couple of decades to create it but after a little more than a decade in use, the same group that pushed for it, now under a different name, began advocating its demise, ironically using the same rationale used to create it. Tragically, it’s too late for the hundreds and hundreds of historic structures that were destroyed to create the “loop,” including the iconic Durham Union Station (shown in a County Library photo below). But the story of the “loop” is not only the story of a near miss but that of an era. More than three decades before the early 1990s founding of today’s Downtown Durham Inc., a predecessor was formed, first as a committee of the Merchant’s Association, then as the Downtown Development Association. When I arrived in 1989 to jumpstart Durham’s first community destination marketing agency, I gathered intelligence by interviewing many of those earlier bygone commercial activists. Refreshingly, they were willing to look back on regrets as well as achievements. The “loop” was meant to save downtown Durham when it was envisioned in 1958. Forest Hills Shopping Center had just opened on the southern outskirts and by the next year, even the increasingly “Black” neighborhood to the east would have a new shopping center, Wellons Village. Rumors, soon founded, were that the Rand family was planning another to the north. Of course, we know now that it was television that was changing the retail landscape by promoting to viewers the misperception that vast regions were centric. This included the notion of driving a hundred miles to buy something consumers could easily find at home, thereby robbing their own local business climate and tax base. But it wasn’t just competition that worried downtown advocates in the mid-1950s. Durham had been the fastest growing county in North Carolina during the 1930s and second fastest during the 1940s, just behind Mecklenburg. But what had Durham leaders worried was how fast Durham still continued to grow into the 1950s, while the number of jobs hadn’t grown since the end of World War II, more than a decade. 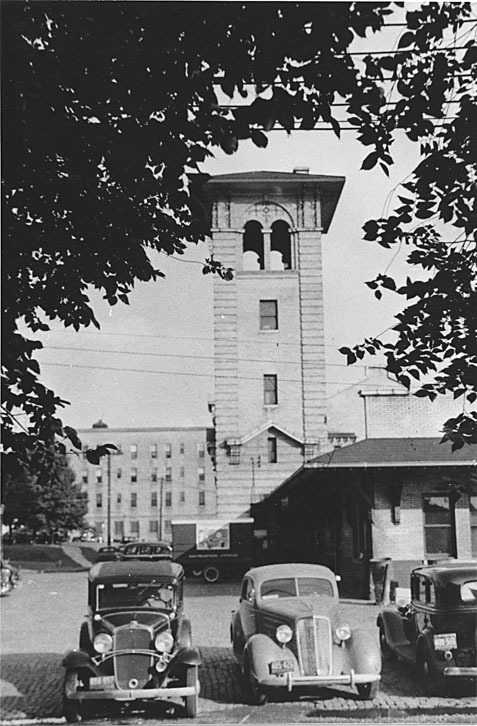 Poverty had first taken root in Durham in a neighborhood now called Edgemont in 1938 after a mill closing there brought on by the Great Depression. But Durham continued to grow economically during the war years, thanks in some part I supposed to four cigarettes including Lucky Strikes and Chesterfields being included in each WWII ratio kits. However, that growth abruptly ended in 1947, while the flood of people moving here didn’t. There is evidence that this imbalance is the root of Durham’s generational poverty rate today. By 1960, when downtown advocates formally proposed creation of the “loop” to local officials, 1-in-3 Durham residents lived in poverty, as did 1-in-4 North Carolinians and about the same proportion of Americans. One rationale used for the “loop” back then was that it would make the Research Triangle Park more attractive to tenants. It was a new project carved out of southeast Durham pinelands just four miles from downtown that Durham leaders such as George Watts Hill and Yancey Milburn, members of the downtown group, had been furiously working to create. The report was shaped in the immediate aftermath of a transition from federal grants for Urban Redevelopment, which had been pushed in the late 1930s, finally passed in 1949 and then re-branded as Urban Renewal in 1954. The program, which had to overcome opposition from rural lawmakers, incentivized communities to tear down old buildings to make way for parking lots and then sell surrounding parcels to private sector developers. However, Urban Renewal was already in disrepute by 1956, when architectural journalist Jane Jacobs gave a presentation at a Harvard conference leading up to creation of a new discipline. It was called urban design, a fusion of architecture and planning that would focus on overall settings rather than icons. As downtown Durham advocates began meeting to plot its salvation in 1958, they should have been reading a new book based on a series of articles that Jacobs and others had been writing in Fortune Magazine. Entitled The Exploding Metropolis; A study of the assault on urbanism and how our cities can resist it, the essays in the book might have helped Durham not only avoid a huge mistake but leapfrog to a new paradigm. Economic development was just beginning a transition from the 20th century’s obsession with “what you don’t have” to what urban researcher Edward T. McMahon calls the 21st century model of focusing on “what you do have,” a transition even today that so many communities have failed to make. Instead, Durham’s downtown advocates issued a report in November, 1960 based on the falling-out-of-favor Urban Renewal, just as Jane Jacobs was putting the finishing touches on a book that would be published a year later entitled, The Death and Life of American Cities. It rewrote the book on rebuilding cities. In fact, Durham’s Downtown Development Association members would have had access to excerpts published months earlier in Harper’s and the Saturday Evening Post which were very popular at the time. Jacobs advocated an organic understanding of how districts evolve, the way Ninth Street evolved in Durham during the 1970s and the way downtown Durham evolved before WWII. She articulated the importance of innate character and what would two decades later be christened as sense of place in an essay by Wallace Stegner. By a matter of days if not hours, Durham was caught instead on the far side of the paradigm shift and soon set about destroying vast swaths of its organic character only to discover that Durham was able to populate RTP and become an economic engine again without it. But a decade later, what I term a sense of place revolt dramatically slowed the destruction and birthed historic preservation here, just as the movement swept across America, as much in reaction the carnage of Urban Renewal as the nation’s upcoming bicentennial. Within a few years a new breed of private developer including a couple who taught business at Duke emerged and began to adapt historic structures to new uses rather than destroy them. By the 1980s they were populated with offices, galleries, restaurants, artists studios, apartments, music venues and stores. The last Durham project predicated on the destruction enabled by Urban Renewal was a convention center and adjoining hotel, which opened in 1989 just as I arrived. They looked as though they just didn’t fit and still do. As a seeming nod to that bygone era, every decade or so since, Durham has continued to erect an icon that doesn’t fit. It is as though the developers, often the local governments that should know better, are still defiantly objecting to sense of place. But as downtown advocates regrouped in the early 1990s to complete the task of revitalization, they were still plagued by the same inertia faced by predecessors nearly forty years earlier. Back then a survey found that 76.9% of Durham residents community-wide supported the redevelopment of downtown including 57.7% who would support a new tax levy to do it. But ironically only 41.8% of the merchants and property owners downtown were positive in regard to either redevelopment or a tax to fund it. Fast forward four decades and the biggest suppressant to bringing downtown fully alive were landowners who didn’t have the means or interest to do so but were sitting on properties hoping others would. This time, fortunately, the federal government came to the rescue with a new secret weapon, New Market Tax Credits, which when joined with historic tax credits and tens of millions of dollars in local government funds, created the turnaround. Even as this second renaissance of downtown Durham took root, many were clearly still under the spell of outmoded Urban Renewal thinking such as the need for icons and very slow to grasp what Jacobs saw so clearly about the importance of sense of place and organic evolution. In a twist of irony, Durham ended up preserving the highest proportion of its historical assets and converting them to adaptive reuse of any of North Carolina’s urban areas and most nationwide. Yet officials, even today, seem prone to fixate on big projects rather than the little things that facilitate organic revitalization and sense of place such as the upkeep and overall community appearance noted in that 1960 downtown report. They fail to understand that Americans, regardless of age, prefer protecting neighborhoods to revitalizing them.